A grand piano falls through the air against the backdrop of an ominous grey sky. Two boxers square up to one another inside the ring of a dimly lit studio gym. Two rams prepare to duel at the cliff edge of a snowy mountain top as the title credit reads: Things you shouldn't get caught between. This is the opening sequence to the new THINK! cycle safety campaign. But what does a piano, boxing and rams have to do with cycle safety you might ask? Well, nothing really. It’s what they represent that’s important: the moment before impact, being caught between two things – a place you don’t want to be. This is the simple idea behind our cycle safety campaign. We want to remind cyclists of the dangers of getting between a lorry and a left hand turn - the area where one third of collisions between cyclists and lorries happen. The advice we’re giving to cyclists is ‘Don’t get between a lorry and a left hand turn. Hang back’. The campaign is also targeting HGV drivers, encouraging them to take the extra time to look out for cyclists. HGVs present one of the largest dangers to cyclists on the road. In the last 5 years, 104 cyclists have been killed in accidents involving a HGV. Startlingly, this accounts for nearly 20% of all cycling fatalities. Better mirrors, proximity sensors and blind spot cameras are making driving safer, but technology improvements will never replace the judgement and expertise of you – the driver – behind the wheel. Taking a proactive approach to improving the safety of everyone on the roads – beyond regulation requirements – is high on the agenda for the freight and haulage industry. Safe driving practices are an integral part of your professional development. Looking out for vulnerable road users is second nature to you. THINK! is all about encouraging each and every one of us to think about our behaviour on the roads. You know the drill. You know to check your vehicle before you set off. You know what to look out for in your mirrors. You know that you should never overtake a cyclist on the approach to a junction. You know to pull up behind cyclists at a junction rather than alongside them. And you know to give them space when you overtake. But knowing and doing, each and every single time, are two very different things. DVSA oversees periodic training programmes for professional drivers. This includes advice about how to interact safely with vulnerable road users and best practice for driving in an urban environment. The training forms part of the Driver Certificate of Professional Competence (CPC) – a qualification that requires top-up training every five years to maintain and refresh driver skills. If you’re a professional driver and you want to find out more about vulnerable road users or safe urban driving then visit JAUPT for details of available courses. So next time you’re out on the road and you see a junction approaching, take extra time to look out for cyclists. As the number of cyclists on the road increase, being vigilant to the movements of riders at junctions is the only way to avoid the potential devastating consequences of a collision. THINK! Take extra time to look out for cyclists. A recent trip to London and walking round as evening started to fall - cyclists wearing black and no lights on the bike. Ever notice when they interview cyclists on the tele - they're all wearing black - even the famous Bojo - dark helmet and a dark suit. Now spot them against tarmac which is what colour? Cyclists must be forced to wear hi-viz and the lighting rules enforced. This is a simplistic video, the driver in the video clip is to blame, as he should not have overtaken the cyclist before the corner, however I am blatantly aware some cyclists are a danger to themselves and ride between other vehicles without considering what the driver is going to do next. Helmets are not the answer, apart from discouraging cycling which is good for them & the Nhs, they don't offer the protection needed in such accidents. Cycle training is needed at Schools & college, with some cycling training being offered for older riders but cycling organisations or retailers. Oh you think the government are inactive do you? Then why in london have they been making the footpaths on the corners of junctions and roundabouts wider and taking down all the railings on the insides of the corners on all the junctions so that vehicle's have to pull out further to turn making it easier to see cyclists coming up the inside and if they do get in the way then theres No barriers to push them under the trucks and a wider path for them to roll on to if knocked of their bikes. Doing nothing eh.? Over the last few years Government statistics state the high level of fatalities involving cyclists and vehicles mainly LGVs, with the statistics comes more regulations for the haulage industry, BUT never do I see or hear of any regulations put in place for cyclists to sit some form of test or training before they are permitted to use busy and main roads ... I know I'm not the only one that see some cyclists undertake vehicles in a dangerous way sometimes damaging door mirrors or paintwork and having a total disregard for the laws of the road and human safety, I've even had drivers tell me of many cyclists holding on to the sides of LGVs and wait for the truck to pull away to get them going ... Are these people MAD!!! I have, for the last 6 years been conducting DCPC courses. My area has been extensive throughout England, Wales, Scotland and Northern Ireland. The latter was for a specific company who had an interest in safety relating to their van drivers and car driving reps. Over the last 12 months at the request of individual companies I have spent a considerable time relating the aspect of Vulnerable Road Users to vocational licence holders at their respective companies requests. To me this shows that these companies recognise this particular aspect with a positive attitude to road safety. The majority of drivers who comment on the subject of cyclists make it known to me they have a concern with who are generally described as aggressive cyclists and cause them problems from time to time in the manner they use their bicycles on public roads. From comments made it is obvious that the users of these machines are out to increase or maintain their fitness levels and the public road becomes a sort of race track for them. As much as I promote the `sharing` aspect of use of public roads it is apparent that the comments made by drivers of LGV and PCV transport indicate that the sharing of the facility is not always respected by bicycle users. I find the latest initiative encouraging, however, I feel more needs to be done perhaps with the aid of presentations to cycling groups who do not need to attend CPC refresher courses to maintain their right to be on public roads. I have suggested that our skills could be passed on through schools, however, I have been discouraged as the element of cost for a `trainer` to attend schools seems to be ever present. 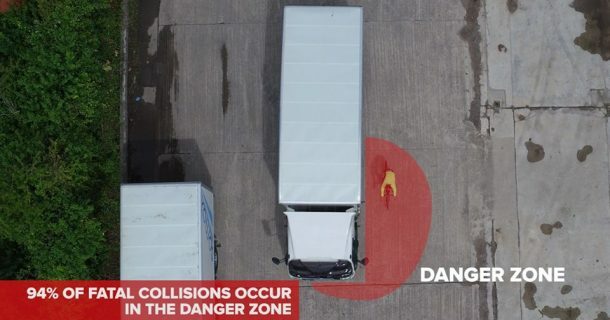 I think that most lorry drivers and cyclists are very aware of the dangers its your worst nightmare for somebody to be killed by a vehicle that you are driving. I meet many cyclists on country lanes and most of them are very careful to make sure that you can pass or overtake them safely and I always pass them at low speed. There are however a growing number of the militant type cyclists who frankly think that they own the road if you come up behind them on a country lane they don't allow you to pass, if you approach them from the opposite direction they expect you to go off the road to get out of their way so they don't have to slow down at all. In towns they are often traveling at speeds that are faster than you are weaving in and out of the traffic and this makes it very hard for drivers to keep sight of them. It is important to run campaigns like the think one but there also needs to be some effort to encourage this type of cyclist to understand the difficulties they cause to drivers and be more respectful in order to avoid angry confrontations that are so unnecessary and uncalled for. Maybe there should be a dual approach as not all blame can be given to the HGV Driver. Half should lay with the cyclist. We have no intention of hitting a cyclist nor anything else on the road. But if we are indicating left and a Vehical or cyclist cuts on the inside we may not be able to react in time. Yes having more mirrors help but the cyclist should never put them selves between a lorry and the indicated turn. Even as we do not follow a normal turn positioning we can move out the Opposite way to the indication. This is not a invitation to sneak though. What we are trying to do is get a good view and we need the extra space to perform the manoeuvre. Education needs to be from both side. I do agree with some of the above but do not think a fundamental redesign is needed extra care from a cyclist can be improved. As in a. Car you would not cut down the inside of a lorry turning. It's a shame you can't extend this advice to all the motorists who overtake cyclists WHILST INDICATING TO TURN LEFT. They KNOW they're going to cut up up and don't care about our lives. Driver training and education is absolutely woeful in the UK. At some stage, for a cyclist to get into the blind spot of a wagon they must have appeared in the drivers mirrors at some stage. So for me, as a driver with over 50 years experience its one mirror check that the driver failed to make, or if they did, they were not focused on the driving task. If I was training a driver I would want them to talk me through that left turn, therefore getting them to concentrate fully on what they are doing at that particular moment. It should be 100% concentration 100% of the time. No excuses. A number of roadside properties would need to be demolished as the requirement for space would increase and having reduced the lane widths for other vehicles, to a point that makes a lot of necessary journeys intolerable, the space would have to be manufactured. Also, whilst blaming professional HGV drivers for collisions, a system of qualification, registration and accountability could be introduced for cyclists. This should appeal to a great number of cyclists who already profess to be highly skilled, but would then be able to prove it. We could also have sensors that detect a cycle and prevent the HGV from moving whilst they are present. Or, simply ban HGV's from Cities. as well as the truck driver being educated about the dangers of cyclist the cyclist need the same full on education as the truck driver this is not happening at the moment and needs to be urgently addressed the behaviour of some cyclist are dam wright dangerous especially in our cities i drive through Bristol regularly and every time you can guarantee you will see cyclist jumping red lights going the wrong down one way streets bouncing paths basically breaking every highway law there is just other night two cyclist two separate times bikes with no lights on round abouts one of them was going the wrong way around it .I am by no means against push bike me and my both own bikes and my wife does a 8 mile commute to Bath every working day .the cyclist are not being educated in this country and yet again the good old truck driver carries blame it would be nice to know what is being done to educate cyclist going around schools is only one of answers because the biggest problem are the city commuter they use to drive there cars like idiots now they are riding there push bikes like idiots nobody likes to see or here of any kind of traffic accident on our highways & roads i agree trucks are big and the uk roads are sometimes small and in ill repair both parties need to be educated so yes the haulage industry needs to look at ways to be safer but other road users like the cyclist NEED to be educated as well urgently to try and bring down this horrific death on our roads . i am proud of being a truck driver and proud of what i do i feel its about time that government bodys and the general public recognise the good job what the truck driver does to keep this country running . Totaly agree with he comments above. I would never ride up the inside of a lorry but what am I to do about lorries over taking me then left hooking right infront of me or worse! Road respect from all and people thinking what am i going to do with those few seconds I save by racing past only to slam on the brakes and turn left or equally sneaking up the inside of a lorry at a junction. Be observant, improve vehicle design and mkae infrastructure fit for purpose. Cycling should be banned on public roads until the HSE conduct an investigation into the feasibility of crash bars being fitted to all cycles. These would be to a similar to the design proposed for motorcycles some years ago . This design would slow cycles down and prevent them accessing narrow gaps in the traffic. An inquiry would take at least 10 years and provide a public voice to all the LGV and PSV drivers who've been scared by the actions of the majority of cyclists. I have been a C+E driver for 40+ years, member of IAM,my companies driver of the year on four occasions and a SAFED trainer. I like the presentation of the video and I think the impact will be very positive for both cyclists and lorry drivers. The main challenge is to make sure they all see it before there are more fatalities or bad injuries. I still believe that more effort should be put into junction design, which allow lorries more room to turn. Clearer lane signage that enable drivers unfamiliar with a route to make the right early decisions is also called for. We need to make sure cyclists obey the road rules like everyone else or accidents will continue to increase in city areas. Too often they sneak by on the inside, unheeding of any danger or potential risk. I find it unbelievable that you can get on a bike and ride into London without any knowledge of the Highway Code, or having taken any proficiency training whatsoever. Why do they not have to ware helmets, have registration or insurance. Lights are not a requirement, and they can ride without them in the rain. Stop blaiming the HGV's and get these cyclist trained!!! 104 killed how many drivers convicted. Cyclelists should be trained & take up the cost of all these changes not the transport industry . Being a professional bus/coachdriver, In defense of my fellow HGV lorry drivers I have witnessed on numerous occasions where cyclists have been careless and downright stupid when it comes to large vehicles manoeuvring. A lot of cyclists are not properly clothed i.e. visual clothing, a lot still do not wear helmets. It should also be compulsory (Law) to partake in a training course to cycle on public roads. Then a cycle licence should be issued, yes that would mean a lot of admin but it would save lives. I totally agree with the above MJ Ray. Stop persecuting Lorry drivers when a majority of the accidents are down to the cyclists inability to comprehend on the dangers of even going near a HGV. I drive a truck and sometimes ride my cycle in London . It must me reminded that safety is everybodies responsibility I see drivers ,cyclists and pedestrians doing things you wouldn't believe . Every advance in technology is welcomed but the last decision is ours. When I ride my cycle I do not go within 3 metres of any large vehicle .trucks , buses coaches etc. As the previous comment how far from the junction is it safe for a truck to overtake a cyclist? If a truck overtakes a cyclist in a safe distance from a junction then slows to turn does the cyclist slow? If a truck is stopped at traffic lights with a left lndicator showing will cyclist avoid going down the near side? The largest trucks we see in London are the supermarket delivery vehicles most of which are articulated vehicles but not very often involved in accidents involving cyclist. This must be looked at. Let's all give each other a little more time , space and respect it's not rocket science we can do it if we work together. Is the reason for so many cyclists being killed or injured is that they havent had proper training or even passed a test before getting on to a bicycle? Maybe if whist in their training/cycling Driving test they had the oppurtunity to be in a truck driving through London or any large town or city either for real or by virtual reality they would then have a better understanding of where or where not to be. Maybe Transport For London could invest in Cycling driving licences to prove that the cyclists are as qualified as the truck drivers. If passing a vehicle on the inside was banned that would cut the deaths for sure! Easy answer! Make illegal to undertake any vehicle!!! If cyclists aren't allowed in that space then there should be no accident!! The number I see undertake and turn right around outside of right turning vehicle is unbelievable!! Educate cyclists more not to put themselves in that position! Here's an idea, why not educate idiot cyclists not to undertake vehicles? The little orange flashy thing on the side of the lorry gives a clue the vehicle is about to turn. Licence all cyclists, stop bothering lorry drivers. Think it's time to start educating cyclist as well, why should all other road users be forced to adapt to cyclists riding habits when a large proportion can't or won't abide by the Highway Code. Seeing an imaginary gap between a motor vehicle and the kerb does not make it safe, a red light is a red light, for everyone. Cyclists need to recognise they are only another road user not THE road users. "This is the simple idea behind our cycle safety campaign. We want to remind cyclists of the dangers of getting between a lorry and a left hand turn - the area where one third of collisions between cyclists and lorries happen." - Simple and obvious but wrong, isn't it? Is there any evidence that the majority of collisions are caused by cyclists getting between the lorry and the left hand turn, rather than the drivers overtaking cyclists on the approach to a left turn junction? It's time to redesign lorries so that direct-vision cabs are compulsory for turning off A roads in built-up areas and redesign many road junctions to include protective islands on the corners with cycle tracks routed behind them, as shown at http://www.ProtectedIntersection.com - why does the government seem inactive on both of these? Typical, blame HGV's. Having driven in London and other major cities, and being very conscious of vulnerable road users, I have experienced excellent cyclists and also diabolic ones who think they can do what they like, including cycling through red lights and not stopping at pedestrian crossings. In my industry we drivers have to do a course whereby we go out on a cycle to experience what is like riding near a HGV, we have to do yearly e-learning and a raft of other training. Our vehicles, quite rightly, have close-proximity sensors, audible left turn and cameras.What do cyclists have to do? Nothing..
Why is it that the most simplistic way to improve these statistics is back to the days of the cycling proficiency tests. Yet again its the haulage industry paying for the lack of vision from people who dart here there and everywhere without a care. It's about time there was a test that ALL cyclists should pass before being allowed to take to the road. How many more lights, signals, signs and everything else that's added to Trucks do we have to have before some doo gooder takes notice..
Boris wants windows in N/S cab doors that will not cure the issue in London or anywhere else. As already i have been to a serious injury of a cyclist with the very vehicle that the mayor want in London. Being a low line Econic with 360 degree camera system audible and visual warning and full length door glass N/S what else can people do have a traffic control on every corner. cyclist should but do not have scene to wear head protection, they should have a registration plate like in Holland, and insurance. Stop wearing head phone and take a riding test, and stop riding or undertake anything irrespective if they think any vehicle is turning left. As when i was at school we were not allowed to ride to school with out taking proficiency test. When is someone going to stand up and make cyclist equally accountable not the do gooders who are firmly putting the blame on trucks these people need a lesson behind a wheel of a truck. I ride a bike but i would ever think to undertake anything, as cars doing so your are fined and possible points lets start on cyclist now and concentrate on the real problem not the effect of irresponsible riders including motor bikes as well. As i drive cars vans trucks small and very large and ride a bike i see all types of driving give lorry driver a break. The above comment appears to put the blame for all the fatalities on the drivers, and he says this because there is no evidence that the cyclist may be at least partly to blame themselves. I have it signs on the back of all my trailers not only warning cyclist of the dangers of passing the trucks on the inside but also that if they cannot see the vehicle mirrors then the driver probably cannot see them. Education of cyclists has to play a great part in this debate, cyclists just get on a bike and ride and I'm sure are not even aware of the existence of the "Highway Code", very often I have had people on cycles squeeze along the inside of my vehicle while I'm waiting at a traffic light or a T junction, then peddle like mad to be in front of the lorry only for me to be stuck behind them for miles and with very few exception none ever look over thier shoulders to see what's behind, whenever you get into conversations with cyclists about this, they take the high ground with attitude and the "I know my rights" thing. Interesting that everyone wants to blame the lorry, maybe lorries ought to voluntarily stop coming into london, no more construction, no more food, no more anything oh hang on you can fetch it from the consolidation centres located around the m25 on your bike! Maybe more co-operation and education for all, instead of just demanding truck design be changed, change the law make cycle helmets, hi-viz and proper non flash lights mandatory and use of the expensive cycle lanes a legal requirement, i have never met a lorry driver that sets out to hurt anyone, but i have met plenty of cyclists who reclessly put themselves in harms way.